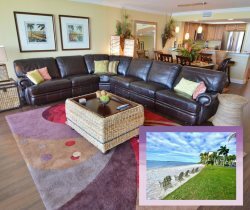 Our vacation rental condos in Sanibel Harbour feature stunning sunset views from your 7th floor screened-in balcony over looking Sanibel Island. This palm beach color inspired condo has cool greens and pinks throughout the condo. The sofa sleeper in the living room allows for extra sleeping accommodations and offers ample seating with two full size sofas. The oversized flat screen TV in the living room can be seen from the kitchen, dining area and the patio with just a tilt in your direction. The master has a king bed and the guest bedrooms have two twin beds and TV's in each room.